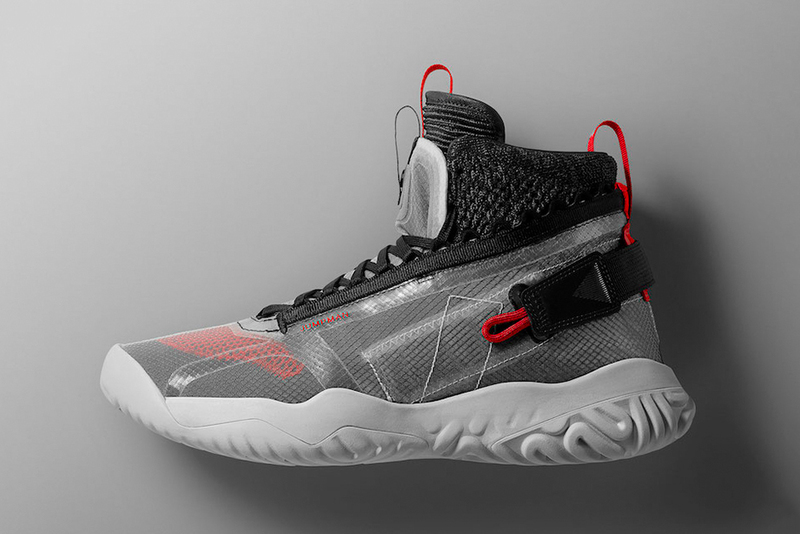 Looking to take advantage of Nike‘s footwear technology, Jordan Brand is kicking off its release of new models that utilize the emerging React foam cushioning with the Jordan Apex-Utility. Set to arrive sometime in 2019, alongside four other new sneakers, the Jordan Apex-Utility serves as a futuristic update of the Air Jordan 1 with functional elements led by the React technology. From the first look we can see that the upcoming shoe features a Flyknit upper covered with a translucent shroud complete with adjustable heel straps and flight-inspired printed details. No official details have released just yet, but it appears that the Flight Utility lineup will be centered around a technical look and features sculpted React sole units. The basketball division already utilized the cushioning system once before on its Super.Fly 2017, which saw the React midsole paired with a lightweight mesh upper and a wrapped rubber outsole. Check out the Jordan Apex-Utility above and stay tuned for more information regarding Jordan Brand’s upcoming Nike React models. Head over to Nike.com for more details. In case you missed it, take a first look at Nike’s upcoming water-resistant Odyssey React Shield runner.